Sun is back out after a brief thunder shower - gave the boat a good coat of muddy rain. Wind forecast looks ok. About 70 degrees apparent moving forward. Speed initially 18 - 20 easing to 10 - 12. 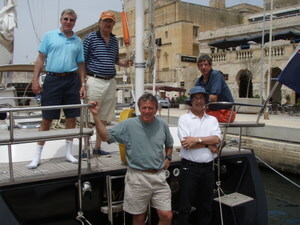 David, John & James back from touring Valletta. We plan to leave at 2:00. Curtis Beg & PLC arrive late Monday. James Watlington, John & David Cooper Wednesday. Active 3 days getting everything ready. Our new dingy looks great in it's bow chocks, dorades replaced with chrome plates. Manuel Island and RLR did a great job. Several lunches and a dinner at Cafe Jubilee opposite the Manuel Island bridge - Great food and value - lunch with plenty of Cisk 8 euros pp. Dinner with John & Monique Wed, David and Claire Lewis Thursday.